Sometimes it seems to be a bit difficult to be a vegetarian. But, in reality, there are tons of recipes available, and, with a little creativity, there is always something good to eat around the house. Last night we were trying to figure out how to best prepare some fresh brussels sprouts that I had picked up at the market earlier in the day. My wife chose a recipe that involved roasting the sprouts along with olive oil, maple syrup, garlic salt and pepper. After removing from the oven, they are tossed together with craisons and roasted walnuts.. 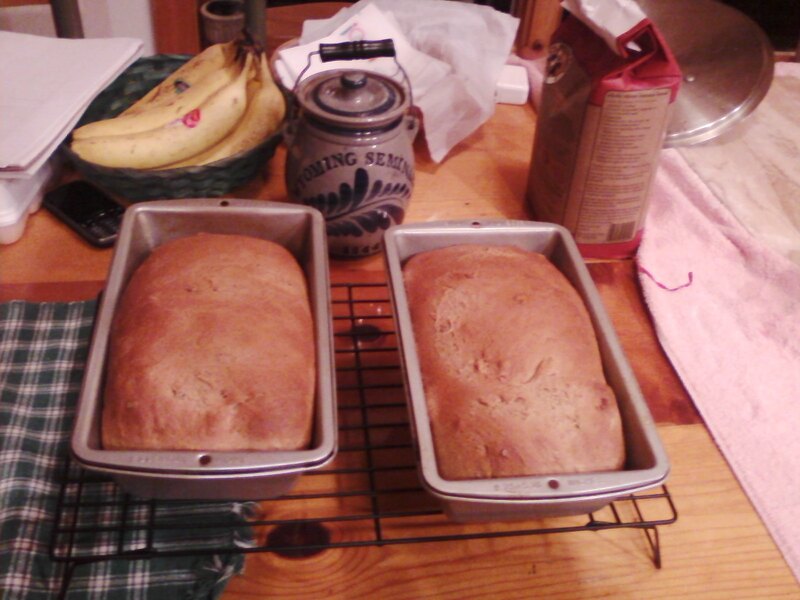 The recipe also calls for blue cheese, but we did not have any of that on hand ( not a problem as far as I am concerned!) What a great recipe! 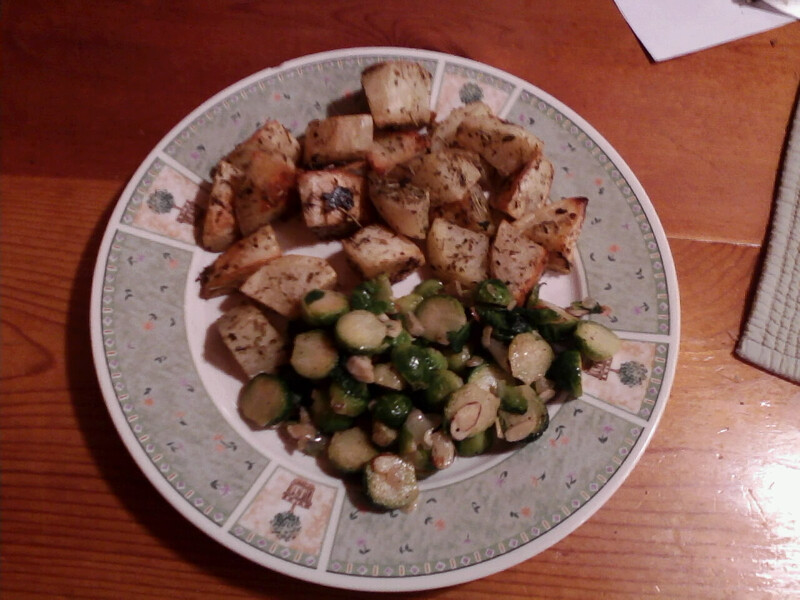 While she was roasting the sprouts, I cut up some potatoes and mixed them with olive oil and seasonings and roasted them as well. I prepared sprouts by parboiling them and then frying them with onions in butter and then tossing them with lemon juice and slivered almonds.. this recipe is also a keeper..
Leave a comment Posted in Uncategorized Tagged alternative dates, brussels sprouts, cooking, roasted potatoes, vegetarian options. Does anyone recognize Ben and Jerry’s in downtown Burlington? How about those happy kids? 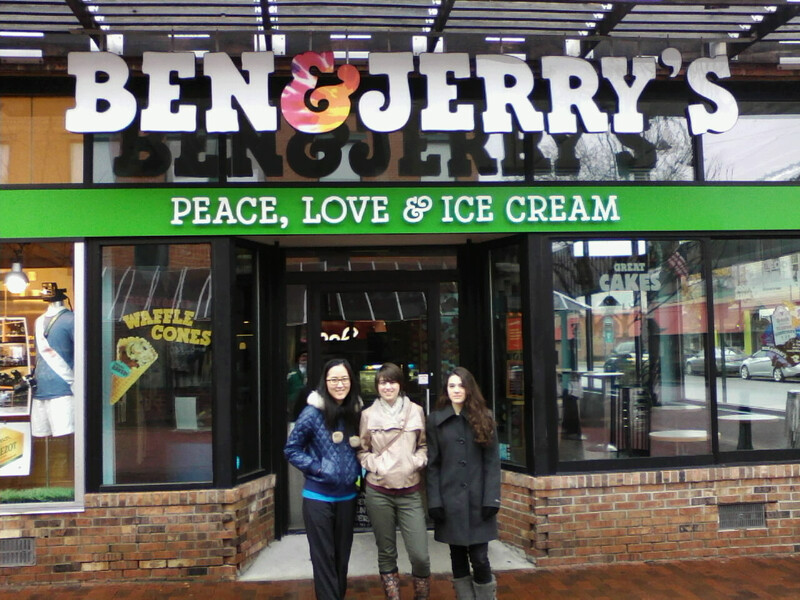 After final exams I had the pleasure of taking my two step daughters and a friend to Burlington. The main agenda for the trip was to see my daughter perform in a concert at Castleton State College. She sings with the Johnson State Chamber Singers who, along with Castleton and St Michael’s, performed individual pieces and then combined to sing Mozart’s Solemn Vespers. My step daughter A, has wanted to check out UVM for a while, so we arranged to combine a visit in Burlington with the concert. We drove to Shelburne where we stayed the first night. It is about an 8 1/2 hour drive from northeast PA, but everyone was happy and upbeat to be headed to Burlington. We stopped for dinner at Panera in Albany and arrived at our hotel just before 10 pm. Everyone was happy to settle in quickly for the night. 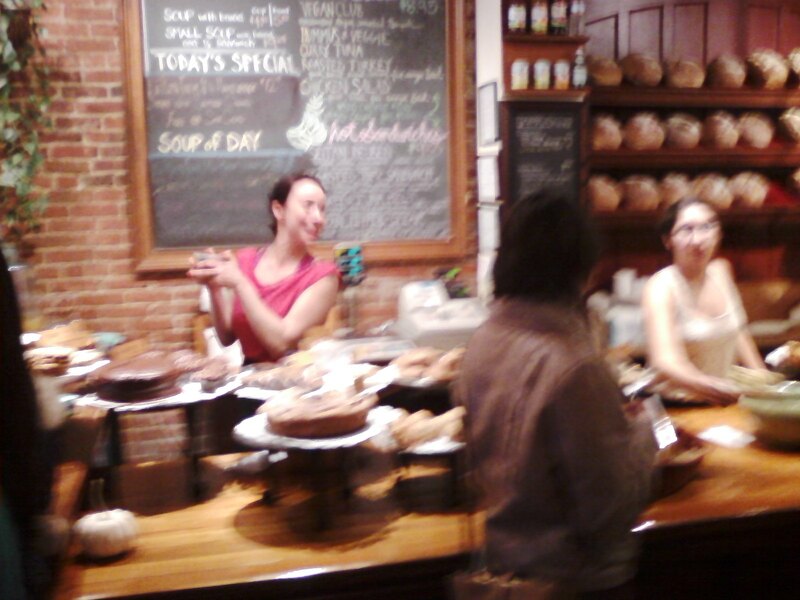 sorry for the blurred pic.. things happen so quickly there! the atmosphere is cool, and the food is wonderful. I had a piece of quiche and a slice of pumpkin pie which was still warm from the oven.. Everyone was totally happy with our lunch experience. 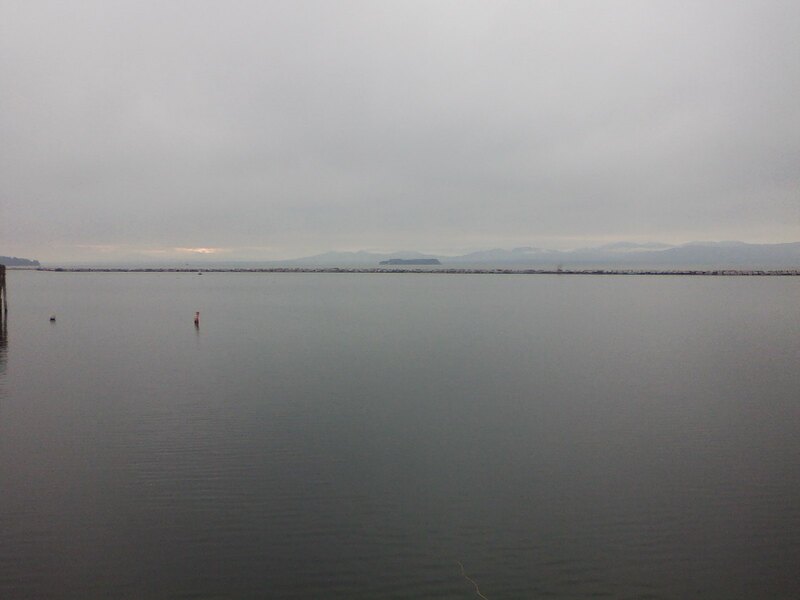 After lunch, the girls headed up Church Street to shop, and I ventured down to the waterfront: it was a dreary day, but a trip to Burlington is fun regardless of the weather. I enjoyed a mint chocolate chip ice cream from Ben and Jerry’s on the way down to the water. I must have looked like a real tourist! We left in the mid afternoon and headed south towards Castleton. The girls all fell asleep and gave me some quiet time on the way. We arrived at the school just as they were finishing up rehearsal so we met Alison and walked downtown to see about getting dinner. None of us knew what to expect, but we found a nice restaurant and enjoyed time together before Alison had to leave to head back to the school. The concert was wonderful. Each group did two or three numbers before combing for the Vespers. We thoroughly enjoyed the concert and the limited time that we had to spend with Alison. After saying goodbye, we headed to Rutland where we were staying for the night. On Saturday we got up bright and early and started home. A. needed to be back in Scranton where she had a rehearsal at 2:30 in the afternoon. It was a short trip, but it was a memorable one! Usually, when I think about a productive day, it is centered around working on the house. For example, yesterday I insulated under our mudroom floor. I am hoping that will make it a little warmer in there this winter, and I always enjoy a sense of accomplishment while putting my tools away after a project like that. We awoke this morning to a dreary, damp, grey sky, and it was apparent that it would not be a day for working outside. Yet, it turned out to be no less productive ( even with a nice mid-day nap) My step daughter, K, and I spent a lot of time in the kitchen. 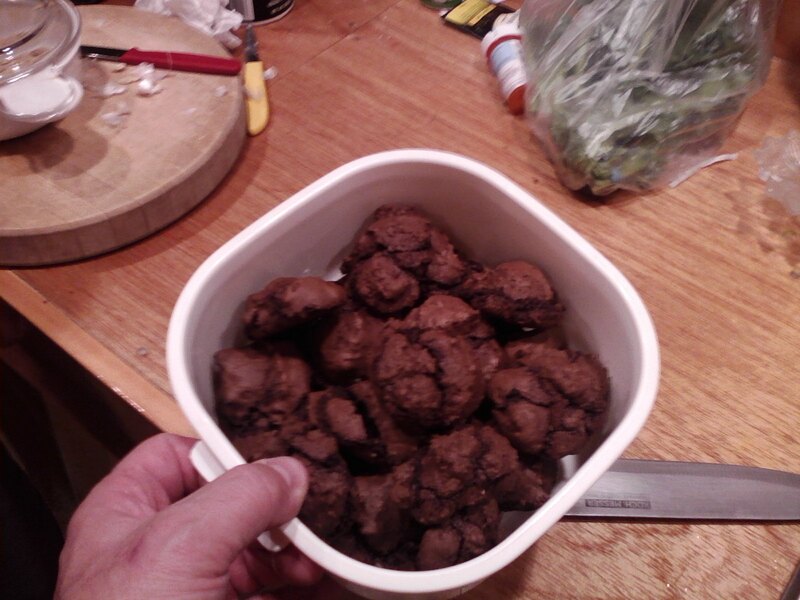 I tackled making vegetable stock for a squash soup recipe that I hope to make this week, and she began with cocoa cookies. the kitchen was a slight disaster through much of the afternoon, but I tried to keep up with the dishes! 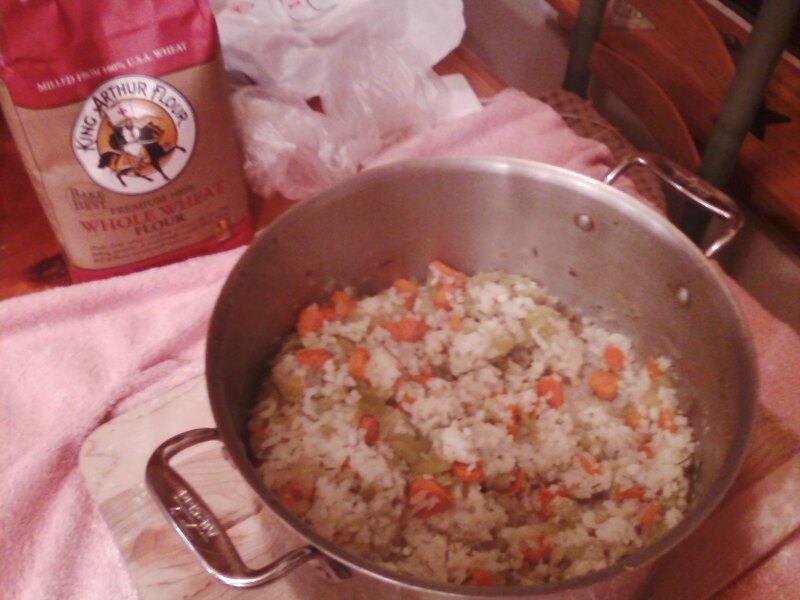 With the vegetable stock strained and in the refrigerator, I used the left over veggies and some of the stock to make risotto. This will also be a dish for the coming week. 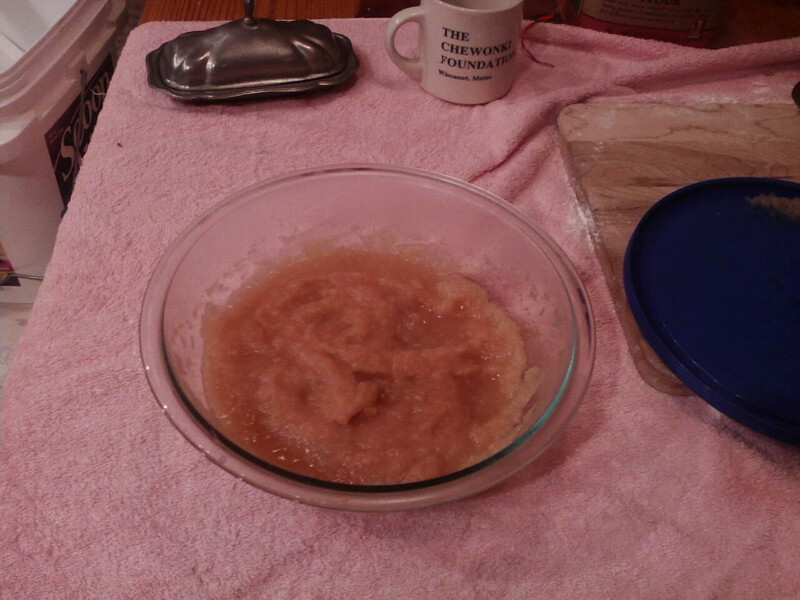 Next we joined forces and made apple sauce. Later in life, my dad grew pretty fond of making apple sauce – this came as a bit of a surprise, because, as we were growing up, he rarely entered the kitchen except to get to the dining room. I ended up with the sieve that we had at home, and this is the first time that it has been used in many years.. K. did not want to put sugar in the sauce, so we simply added cinnamon sticks to the pot, stewed the apples for a bit, and then she made the sauce – it is wonderful! 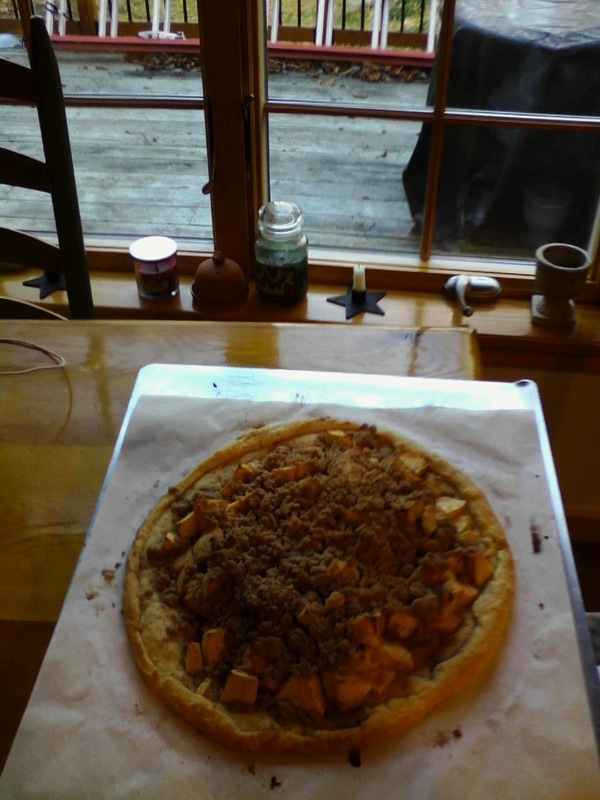 ( thanks to the apples from the family orchard 🙂 ) K. and I agreed that spending a day in the kitchen is more fun than school!